Do you ever wonder what to do with the rest of the bat after you've used its wings for your potent summoning potion? Well, if you're up on the latest coven trends then you're probably familiar with the new fur-trimmed version of the pointy hat classic. 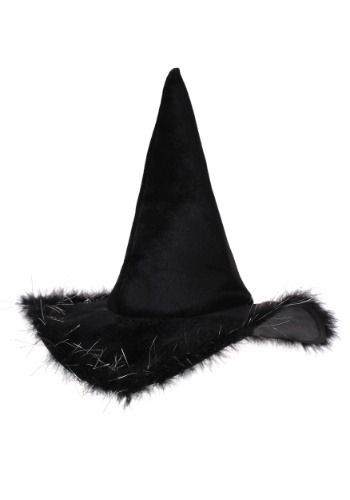 Some witches have been wearing the same hat since the Salem trials, so it's about time for an update! Now, you could harvest the bat fur from your potion leftovers but it takes a lot of time to get enough soft black fur for one hat. If you want to be ready for your next full moon witchy rendezvous then we suggest going the easier and more animal-friendly route and order your updated look from us! Not only does this hat have a velvet texture throughout, it also has a luxurious fur trim around the brim. The fur is peppered with silver tinsel so your ensemble will be enhanced with a moonbeam-like sparkle. You'll feel sassy with the moldable wire brim so you can set your hat just right. If your eyes are set on the newest update to witchy fashion then you better go with it. These fashions only fluctuate every couple hundred years, so have fun while you can. You're sure to have a good time with your charms when you're rocking this look. Who knows maybe you can even make amends with those poor bats. If you promise not to whip up any summoning charms, maybe they'll agree to give you a ride to the next coven meeting. That's what we call arriving in superstitious style!